Access control systems, commonly known as door entry systems or intercoms are available in a huge range of styles, shapes and sizes. 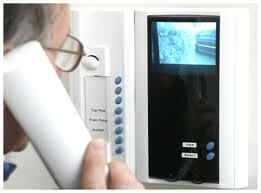 There are two main types of system which are Audio access control systems and Video access control systems. Audio entry systems use only speech as a means of communication usually via a handset situated inside the property, and a buzzer or speech panel externally at the entry door. Video entry systems use both speech and a video image as means of communication. This enables the recipient to visually identify the caller and also view any guests they may have brought along with them. This is achieved by a speech panel with a built-in camera or via a standard speech panel and the installation of a stand alone CCTV camera. Both audio and video entry systems can be connected to electronic locks and other devices to enable the user to allow access to their property without having to manually unlock the door. Door monitoring can be installed which means that the user is notified when the door has been closed behind the caller helping to ensure maximum security. This can benefit a range of people. An elderly person who is unsteady on their feet or has trouble getting to the door in time can speak to the caller, identify them either by voice alone or by the additional aid of an image of the caller, and unlock the door if they so choose. By the same token, either a busy parent or household can save time in leaving the house or children to talk to callers and unlock doors or gates. Multiple access points (speech panels) and user stations (handsets) can be installed to manage more than one door from several locations or a mixture of both. Lynx Electrical and Security are proud to offer a wide range of access control products from the worlds leading manufacturers. Our installations and customer service are second to none, and can be tailored to suit your own unique requirements.